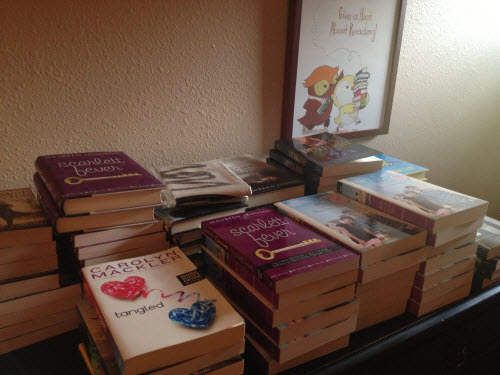 kt literary » Blog Archive » Web Monkey-required Book Giveaway! In addition, I have some galleys — 18 copies of LOLA AND THE BOY NEXT DOOR by Stephanie Perkins, 1 copy of SCARLETT FEVER by Maureen Johnson, and 3 copies of XVI by Julia Karr. So here’s what I’m asking for! Please leave a comment below if you can take a large number of these books. I’m not going to send them out in drips and drabs. I’m ideally looking to send one, maybe two or three large boxes to someone who can make a home for multiples. Is it you? And just to sweeten the deal, I will add a sticker set from the pre-order campaign of THE MADNESS UNDERNEATH with each box of books sent. Limited time offer! Act now! I'm a blogger, and I give books to a specific school and library–I'd love to spread the love with these books here in SoCal! Thanks for responding, Ava. I'm gonna send them to a few teachers and librarians directly, but I appreciate your interest! Please feel free to send any middle grade my way. I teach special ed at an elementary school and my students with reading trouble are not able to tackle YA quite yet. I can also pass books onto the general ed teachers. Enjoy your cleaning! You are so thoughtful. I'm a 10th grade teacher in Virginia and would LOVE these books! I can also find homes for any multiples because there are several new teachers at my school who are working on building up their classroom libraries–plus we are a lucky high school in that we have several reading teachers (reading support usually stops in middle school) and they always need more high interest books! Kate, Katharine, and Kate G. — you got it! Send me your addresses to daphne.unfeasible@gmail.com, and I will prep the shipments. Can you take galleys, too, or just finished books? And thanks for everything you do! My friend (in Castle Rock, CO) runs "Mary's Books" collecting books and donating them to Children's Hospital for patients to read while they are there. They are is serious need of YA books, as most of their donations are for younger audiences. If you have any left over now or in the future… let me know… I'll come and pick them up! If you have any books left the Children's Hospital of Philadelphia would greatly appreciate some books. I volunteer in the Children's Hospital of Philadelphia's library and we are always in need of books for our shelves. There are so many children's book but, not many young adult books for the patients to enjoy. I became involved in volunteering in the library because my son was born with Spina Bifida and many long nights in the last 11 years have been spent in the library trying to distract my mind from reality. My son, now 11, wanted to give back to the hospital so we decided to volunteer together in the library where he could give back to the hospital that has done so much for our whole family. My wife and I are interested in sparking a reading habit in the reluctant readers, especially with middle school to high school boys. She teaches freshman English at our local high school and I'm starting a Guys Read group through our public library. We would appreciate if you have any leftovers of the "boy" books from your collection to help start a small Guys Read section in our young adult section of the library. I am donating Miss Peregrine's Home, Scary Scene in a Scary Movie, The Cheshire Cheese Cat, Hugo, and Peter Nimble and his Fantastic Eyes from my collection and would love to have a few more titles to start the program with. Thanks for opening up your shelves to help young readers. Awesome (as usual).